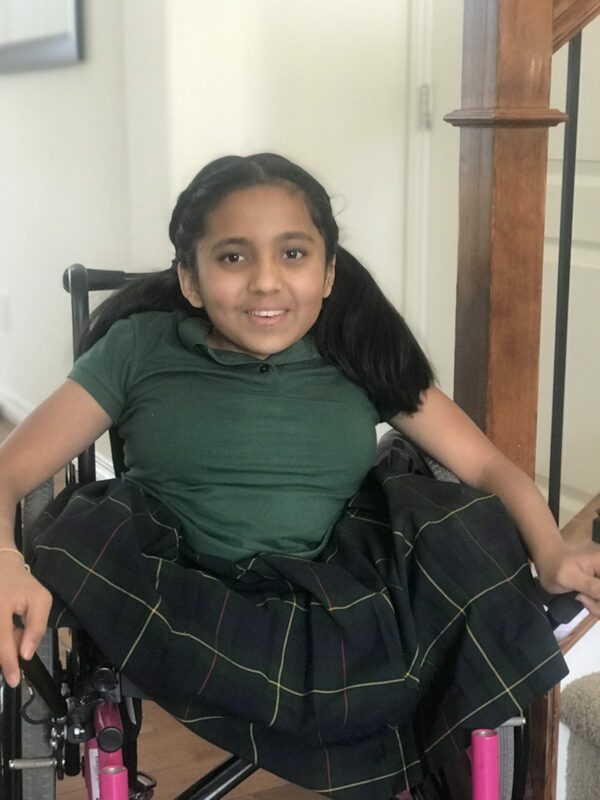 Help the HBF raise $10,000 to fund a lift for Aloukika P.
Aloukika is a beautiful 13-year-old girl living in Parker, Colorado. Aloukika is an actor at Phamaly Theatre Company, loves to dance and even has her own YouTube channel! Aloukika is an active member of the “Youth Advisory Council” at Children’s Hospital Colorado and is the voice of patients to improve the hospital. Aloukika was born with a congenital defect “Caudal Regression Syndrome” which left her paralyzed from the waist down. She has webbed legs and is permanently disabled. As she continues to grow, it’s very tough for her to do basic day to day activities like going upstairs to her bedroom and bathroom. Right now, the only way to navigate the stairs is by crawling. Aloukika needs the assistance of HBF so that she can regain her dignity and independence. The HBF recently installed a vertical platform lift and door openers allowing Aloukika to safely and independently enter and exit her home. To allow Aloukika a fully independent life inside of her home she needs a custom, curved stair lift from the first floor to the second floor. The curved stair lift would eliminate crawling up and down the stairs and allow Aloukika the freedom to fully access her house. We need your help! To allow Aloukika independent access to her entire home, the HBF needs to install a curved stairlift. To do so, we need your help to raise $10,000 to fund this portion of the project. Installing the lift would eliminate Aloukika crawling, or her parents carrying her on the stairs. Granting her this independence will be a dream come true for Aloukika and her family. It will also make it easier to have Aloukika’s friends who also use wheelchairs come and visit. Please consider a donation to help make this lift possible for Aloukika and her family. Any funds raised beyond $10,000 will help the HBF continue to approve and complete projects for deserving recipients, like Aloukika.